Flights from the US typically arrive late at night in Quito, Ecuador and it was an absolute delight to wake up at the five-star Casa Gangotena. The renovated mansion on the corner of Plaza San Francisco is centrally located in Quito’s colonial quarter – an ideal location to begin and end walking explorations of the city. Quito is one of the highest official capital cities in the world, standing at 9,350 feet above sea level, and the first World Cultural Heritage Site declared by UNESCO. One doesn’t dwell on the facts when wandering the cobblestone streets though because it’s so easy to get caught up in the vibrancy of daily life here. Street peddlers hawk their wares, geraniums brightly adorn balconies, and smiles are given freely from passersby. La Ronda was my favorite street. The narrow calle has a storied past; in colonial days it held a reputation of both rowdiness and revolutionary ideals, its watering holes serving poets, musicians, politicians and, as legend has it, a young monk who would scale the wall of his cloister to partake in such sinful misgivings. Today La Ronda is a sleepy street with little surprises tucked away behind its adobe walls. We visited an ice cream shop and tasted exotic flavors like guanábana (soursop), granadilla (sweet granadilla) and pitahaya (dragon fruit). A highlight for me, an art historian nerd, was a small metallurgy shop that practiced the colonial techniques of casting and molding metal for restoration of the cathedrals we had just ogled over in the morning. Outfit styling by Primp Boutique. Inquire with Primp for details and find a location near you on their website. Although the equator runs right through Ecuador (hence the name), because Quito is located at such a high elevation it doesn’t feel tropical at all. We recommend layers as it’s chillier in the shade and evenings, and warmer in the sun when you’re walking around. Quito is a fairly casual city, but I always feel out of place wearing outdoor gear when locals are in pantsuits on their way into the office. A darker pair of skinny jeans with comfortable flats and a patterned blouse are a nice middle ground. I brought a lightweight blazer as a top layer, and dressed my outfit up in the evening for dinner with accessories, which have the added benefit of taking up little space in my suitcase. The cloud forest is aptly named as one literally feels like they’re walking through a cloud. It’s generally a tropical or subtropical forest characterized by a persistent low-level cloud cover. In Ecuador, the cloud forest is especially inhabited by a diverse range of birds, bugs and flora. We stayed at Mashpi Lodge, located about an hour northwest of Quito. The roads to get there are well paved, but very winding with spectacular views as you descend from high Andean mountains down to lush, beautiful cloud forest. The change in climate can dehydrate you quickly, so make sure to drink lots of water throughout your stay. Mashpi Lodge, set in the heart of the cloud forest, has impressive glass walls enabling you to escape the bugs and heat of the forest, while still enjoying its natural beauty. 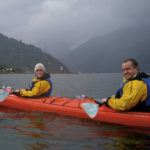 As I’m by no means a birder, I found the wildlife intriguing – but it was the conversations had with the naturalist guides, some from Quito, but many from the local village that set the experience apart. They were so open to sharing stories from their lives and had a contagious passion for the delicate ecosystem that they cared so much for. Some of the guided excursions included hikes to waterfalls, a climb up a canopy tower that enabled you a different perspective of the cloud forest (if it wasn’t too cloudy of course! ), a sky bike allowing you to actually bike through the canopy, and a visit to a butterfly center where their life cycles were described. The cloud forest was really hot and muggy and there were short rain showers that occurred periodically throughout the day. On excursions we wore athletic stretch pants – they dried quickly and also prevented chaffing on your calf from the rubber boots that Mashpi Lodge supplied for the muddy trails. For men I would recommend longer lightweight pants as well. A tank or short-sleeve, quick-drying top is great for excursions and bring as lightweight of a raincoat as you own that’s roomy enough to cover your camera (Mashpi Lodge also provides ponchos). Since you’re walking through the shade in the cloud forest, long sleeves aren’t necessary for protection from the sun, but if you are opposed to using bug spray you might want to consider them for that reason. Because it’s hot and muggy, it’s not uncommon to sweat through your outfit. Mashpi Lodge does offer laundry service (and drying free of charge) but if you don’t want to bother with that, bring an extra change of clothes for each day of your stay. It felt so refreshing to shower and dress up a bit for dinner in the evenings. I brought a couple loose-fitting dresses, like the one shown above, that were perfect for the evenings here, and in Galapagos Islands as well. You’ll probably think I’m being dramatic, but our stay at Hacienda Zuleta was honestly a dream come true for me. On arrival to the hacienda we were greeted with a glass of wine, cheeses made at the farm, and a warm fire. Fernando, the grandson of former Ecuadorian President Galo Plaza Lasso and who now runs Hacienda Zuleta as an experience and accommodation for travelers, told us stories of his family, the indigenous communities in the Andean regions surrounding Zuleta and the changes Ecuador has seen from ancient to recent times. Renee told me later that she was thinking to herself how amazing that night was, experiencing the hacienda in such an authentic way. And then she looked over at me and had to laugh because she could tell I was in extreme awe – cheese, horses, history! All of my favorite things! I could hardly sleep that night actually for anticipation of the ride I was going on the next morning – just a couple of us experienced riders went with the vaquero Jose to bring in the herd of fifty horses down narrow cobblestone lanes at a canter. That’s part of what’s so special at Zuleta – you can experience a way of life in such a non-touristy manner, be it from helping bringing in the herd or trying your hand at milking a cow. Horses are a cultural and activity focus at the hacienda, but there is plenty to do for non-riders there as well, including a visit to the condor restoration project, the nearby volcano, or self-guided hikes which are great for losing yourself in your thoughts and the stunning landscapes. Meals are served family style on the original long wooden table that Fernando ate at as a kid. It’s possible to explore the surrounding indigenous communities, learning about ancient customs from medicinal herbs to embroidery. The weather in the Andean countryside is similar to Quito with warmer days if it’s sunny and cooler evenings. Although during the day it was warm enough to wear just a T-shirt, I preferred longer-sleeved loose fitting shirts because at high altitude the sun is so strong. For hiking excursions athletic or lightweight hiking pants were great with sturdy-soled tennis or hiking shoes for the uneven terrain. For horseback riding and visits to the surrounding communities I wore the same skinny jeans that I used in Quito. A scarf, lightweight sweater or fleece (button or zip down is nice when your riding to avoid having to remove your helmet to take the layer on and off) was great to have on hand during the day and were definitely worn in the evenings even inside as Hacienda Zuleta is somewhat inconsistently heated by wood burning stoves. Dinners are casual as Fernando encourages you to feel as though you’re in your own home, and truly succeeds at doing so. We saved the Galapagos Islands for the last part of our journey and instead of opting for a cruise, stayed at Galapagos Safari Camp. The camp adopts the African safari concept of tented, yet appropriately luxurious, accommodations that serve as a base to explore Santa Cruz Island or boat to other nearby islands as well. Having experienced Galapagos expedition cruises before, I loved the freedom of a land-based option. You’re not limited to a boat and your excursions can take you to parts of the Galapagos Islands that aren’t part of the National Park, so you’re not always restricted to certain paths. One definitely doesn’t view as much of a variety or quantity of wildlife staying on land in the Galapagos but depending on your interests, it could be the perfect fit. Personally, I was more than satisfied seeing the famed tortoises, blue-footed boobies, frigatebirds, both land and marine iguanas, sea lions, and sharks, angel fish, parrot fish, rays and more while snorkeling – all of which was easily accessible during day visits to nearby islands or on Santa Cruz Island. What we did experience at Galapagos Safari Camp that a cruise doesn’t offer was the warm hospitality of husband and wife owners Stephanie & Michael. Their passion for their project and their guests was unsurmountable. The couple shared their very real challenges of raising a family on islands lacking high quality medical care and schools. They also talked a lot about the sustainability measures that need to take place in such a closed eco-system. Their insights made our stay at Galapagos Safari Camp unique, along with the wildlife viewing and snorkeling excursion to North Seymour Island, a bike ride to a local beach where we kayaked, a visit to an organic coffee plantation and chocolatier’s shop, a stop at a deserted beach with endless sandy vistas and, of course, a visit to a tortoise preserve. Our only regret was we wished we had more time to spend at the camp enjoying the peace and tranquility of the natural setting and the amazing cuisine. The Galapagos Islands are dry, hot and managing the sun exposure can be a challenge for travelers. A hat is not only great for shading your face from the rays, but also for protecting your scalp. For excursions we wore shorts, long-sleeved and lightweight tops that provided maximum coverage but still allowed for airflow. Closed toed Keens or Tevas were great for the rocky terrain and wet landings from the dinghies and less hot than tennis shoes (they were also handy to have taking a dip into a waterfall in the Cloud Forest). 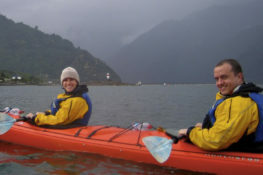 For excursions that involved the water I wore a swimsuit, cover-up and brought my scarf that I used in the Andes along to double as a towel to sit on or dry off. For snorkeling, Galapagos Safari Camp provided shortie wetsuits which not only kept one warm in the cool currents, but protected one from the sun as well. I would recommend using a rash guard or swim shirt if you’re not provided with a wet suit. It’s also handy to bring a dry bag for your camera just in case! The evenings here were still warm and I wore the same loose-fitting dresses that I wore in the Cloud Forest for dinner. Comfortable walking shoes – either tennis or hiking shoes, closed-toed Keens or Tevas, and cute, comfortable flats depending on which locations you visit. Consider a collapsible walking stick if you have trouble walking on uneven terrain. See each location above for details on pants and short vs. long-sleeved shirts. A lightweight sweater or fleece was useful in all four locations in the evenings. Accessories, although definitely not necessary, are a great way to dress up an outfit while taking up little space in your suitcase. For more information on planning or packing for your trip to Ecuador view our Galapagos Islands and mainland trip ideas or visit the Ecuador FAQs section of the site. 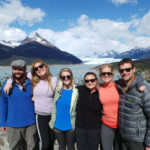 Knowmad Adventures is a local Minnesota travel company that builds active, authentic and sustainable travel experiences in South America. Our team is always happy to chat packing and general travel tips. Give us a call at 612-315-2894 or email us at travel@knowmadadventures.com.